Our club President, Paul Andreas, was on the door to meet and greet everyone. He pointed everyone in the direction of the kitchen, where a rather special birthday cake had been made by Jenny Taggart to celebrate our VPE Susan Rayner’s birthday. Neil our Sargent at Arms made sure that the meeting started on time and then handed over for a short introduction by our President. The effervescent Richard Green our VP Mentoring, explained to visitors and newer members about the mentoring programme. This allows members to pair up, if they wish, to get additional support on their speaking journey. Our Toastmaster for the day was Susan who led the meeting with warmth and humour. Happy Birthday Susan. Our meeting as usual started with a warm up. This allows members and visitors to introduce themselves and answer a simple question. Sue Shaw’s question was ‘what is your favourite food’. Paul Lynch then gave the Hot Tip. He encouraged members to use the whole speaking area to add energy to their performance. He also explained that movement can help to relax a presenter. Our three main speakers for the evening all spoke about subjects close to their hearts. Margot Glover gave a very impressive speech for her first assignment with the intriguing title of ‘My encounter with the Grinch’. She spoke about why 1 December each year, (our meeting date,) was a difficult time and how she has moved on. A very brave subject which was well delivered. Jenny Andreas presented her CC3, the ‘Get to the Point’ speech. The title was ‘Keep on Dreaming’. Jenny spoke with passion about working to reach her dreams and helping others. She explained, that even when barriers are put in the way on your first option, that you can still work towards your dream on an alternative route. Our last speaker was Karen Mefflin who is working through the advanced manuals. She used great vocal variety and facial expressions for her Interpretative Reading assignment. She chose ‘I married a man with no emotion’ by Abbie Jones. It was a good insight into people effected by Asperger’s syndrome. The speeches were evaluated by Tony Smith, Paul Lynch and Richard Murray who all found much to commend and were able to also give suggestions for future assignments. After the break, and more scrummy cake, Eddie Barnes was Table Topic Master with a potpourri of subjects ranging from favourite author to cryogenics. The Topics were expertly evaluated by Riya George with encouragement and great advice. Jenny Taggart as timekeeper, gave clear signals throughout the evening to help keep everyone on track. Also helping members to achieve excellence were Neil as Ah Counter and Richard as Grammarian. We all benefit from sharing talent and experiences across our clubs, so it was excellent to have Stephen Davis from Croydon Toastmasters along. He delivered a very polished and professional General Evaluation at the end of the evening. 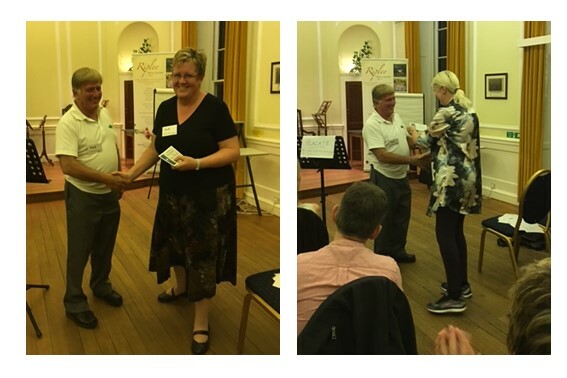 The meeting finished with our President awarding certificates to Margot (Best Speaker), Richard Murray (Best Evaluator), and sharing the honours for Best Table Topic, Sue and Neil. Paul also presented Richard with his Advanced Communicator Silver. The next meeting is our Christmas Special on Thursday 15 December at 7.30pm when there will be more cake and nibbles. Our meeting this evening brought out the true spirit of Toastmasters, with members stepping in at the last minute to fill various roles. This is because transport and other problems prevented some members from attending. So, the meeting was opened by Paul Andreas, who then introduced the President – himself. Paul reported on the workshop that he had attended earlier in the week with Craig Valentine, reputedly one of the best speakers and coaches in the world. Paul then encouraged members to subscribe to the London Speakers’ Newsletter to stay informed about similar events. The Toastmaster of the Day was Alain Culos, an Engineer who likes to be prepared, which is why he chose the theme of Preparedness for the meeting. Our first speaker was Neil Pettigrew, who gave an excellent educational speech about “Strategies for Impromptu Speaking”, a subject that he knows a lot about. He shared with us some tips, which have helped him to become very good at Table Topic speeches and win several TT Contests. This was followed by Georgina Singleton, whose speech title was “Boring”. Georgina managed to make an interesting speech out of a boring subject, “Pensions”, which she embellished with an excellent Powerpoint Presentation. The third speaker was Richard Murray with an inspirational speech about how we react to circumstances. Are we like an egg, which goes hard in boiling water or like a potato, which goes soft in boiling water? We can choose and make a Spanish Omelette with the results! After the break we were entertained by Table Topics led by our TTM, Luke Dzierzek, who did an excellent job especially as he has been a member for only five weeks. The award for best evaluation went to Dave Hampton, best speech award went to Richard Murray and the best Table Topic Award went to Eddie Barnes who gave a humorous speech about his struggle with new technology. It’s great to welcome Eddie back as he has been unable to attend the club for several months. Congratulations on winning an award on the first meeting back. The meeting was wrapped up with a presentation of their pins to the new Committee. Simon Maggs was unable to attend the meeting because he broke a bone in his foot earlier that day. We wish him a speedy recovery. The day after our meeting Richard Murray competed in the “Corporate Speaking Challenge 2016 Contest” and won. The competition was fierce, as the quality of speeches was high, with ten finalists so congratulations, Richard, who gets to keep a big silver cup for a year, as a reward. Congratulations to Neil Pettigrew who celebrated his 60th birthday at the Knights Templar pub last Saturday with friends from school, uni and the various clubs that he belongs to – a great evening of food, drink and dancing to some of Neil’s favourite music. Neil Pettigrew opened the meeting then handed over to our President, Paul Andreas. Paul reported back on the advanced club, Excalibur’s, open evening the previous week and encouraged members to visit Excalibur, so that they could learn some advanced speaking skills and then bring back to their home club. Richard Green was the Toastmaster for the evening who then introduced his team of Simon Maggs, Timekeeper, Georgina Singleton, Grammarian and Margot Glover, Ah Counter. Jenny Taggart then warmed us up and Alain Culos gave us a Hot Tip, which was to remember to shake hands when transferring the stage to someone else. The first speech was given by Luke Dzierzek, a new member, giving his Icebreaker speech. Luke told us a very interesting and entertaining story about his love of music and how his hobby had become his career. This was followed by an entertaining speech about the Moon Landings by Dave Henson. The final speech was an educational speech from the “Successful Club Series” titled “Evaluate to Motivate” by Paul Andreas. Paul gave a presentation about how to create excellent evaluations, using the CRC sandwich method and then use them to motivate, inspire and encourage other members. This was followed by the break and the opportunity to eat some of the delicious biscuits that Neil Pettigrew, our SAA, had provided. In the second part of the meeting we were entertained by some very interesting Table Topics, dreamed up by our TT Master, Karen Mefflin. After the meeting several members retired to the Anglesey Arms, where there was a very lively discussion about moon landings, music and evaluations – amongst other things. Sargent at Arms, Neil Pettigrew kicked the meeting off on time and tempted us with the promise of chocolate fingers in the break. He then passed over to our President Paul Andreas who reported on the previous weekend’s Division competition and the organizational role that the club had played to make the event such a success. He then urged all members to attend the District competitions being held in Woking on 5 November 2016. Toastmaster for the evening was Sue Shaw who made reference to historical events that had happened on the 20 October and asked us to make our own history. On the stopwatch and lights this week was Georgina Singleton who reported on timings and ensured that we finished the meeting on time. Great job! A big thanks to Margot Glover who despite her long journey that afternoon from Wolverhampton led the warm up with charm and poise. Her question for everyone was, what we are looking forward to now that winter is approaching. Cosy pubs, hot water bottles and not having to mow the lawn were among the answers. 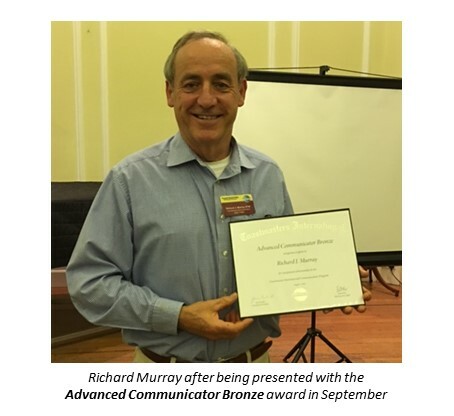 Our hot tip was from the very experienced Richard Murray who gave advice about gauging the amount of content that you need for a speech e.g. know how many words you speak a minute. He also suggested that if you are writing a full 5-7 minute speech it will equate to two sheets of A4 at 14 point. Our trio of speakers were very diverse. Jennifer Andreas undertook her second speech since joining; John Cross his ninth (Persuade with Power) speaking on sugar tax; and Jenny Taggart, The Roast, from the Advanced Manual Specialty Speeches. The Roast is a chance to gently poke fun at someone with their permission, using humor. The best bit is that the target is allowed to respond if they wish, which Richard Murray never shy to speak took. Most members had not seen this assignment being tackled before and it did show that the Advanced Manuals give depth and greater variety to the Toastmasters experience. The evaluators Richard Green, Alex Clark and Neil Pettigrew all gave well balanced reports with recommendations and commendations to the speakers. Apart from knowing how to improve it is important to know what we do well so that we keep doing it. After the break, when all the chocolate fingers disappeared very quickly, the very affable Tony Smith was in charge of Table Topics. He provided a wide selection of subjects to get everyone’s brain working. Ian Brett gave insightful feedback on the session. Well done to all for stepping up to the challenge, especially visitors and returning members. A good tip from Ian was to drill down to the detail so that you can fully explore the subject given. Further suggestions from our Toastmaster on filling the time in Table Topics, was to slow down, use the pause, and to do a summary of what you have said so far. During the meeting Alain Culos kept an ear out for unnecessary filler words and repetitions. He delivered a very structured and well organised report. Karen Meflin as General Evaluator, gave an overview of the meeting and provided valuable feedback to the functionaries of the meeting. The evening was then handed back to our club president Paul Andreas to hand out the awards. 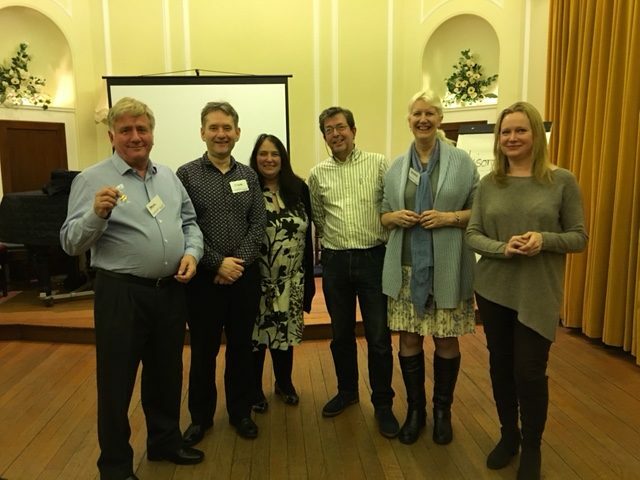 Top table topic speaker was Neil Pettigrew, best evaluator went to Richard Green and best speaker on the night to Jennifer Andreas with her speech titled ‘A fear of animals’. Thanks also to Susan Rayner as VPE for all her work behind the scenes pulling our meetings together. The next meeting will be on 3 November. at the end of your presentation to acknowledge applause. You also need a pause ……. to breathe. After your talk take a few quiet moments to reflect on your performance. Finally – If you haven’t enough time to include pauses within your presentation, you probably have too much content. …the very next day was our club meeting on Thursday, 6 October. Our SAA, Neil Pettigrew, opened the meeting then introduced our president, Paul Andreas, who welcomed our five guests then gave a brief talk about mentoring. Richard Green, our VP of Mentoring, then encouraged everyone who did not yet have a mentor to come and see him so, if you would like to be a mentor or mentee, please give your name to Richard Green. Our Toastmaster for the evening has a memorable name –his name is Paul Goodhill, who led the evening with his usual wit. Our hot tip was given by Sue Shaw, on “the pause”. A reminder of this will follow, and will also be available to re-read on the Bromley Speakers website. We were then entertained by three speeches: Jenny Andreas gave her Icebreaker speech and talked about “Her Journey” and Julie gave her speech number Two, talking about the difficulties of juggling a very demanding job with demanding young children. Richard Murray then entertained us with a humorous speech titled Dr Tim about the time that he got distracted when he was filling up his car and broke down on the motorway as a result. He had to call out Dr Tim to drain the petrol from his car to get going again. And this was the second time it had happened!! 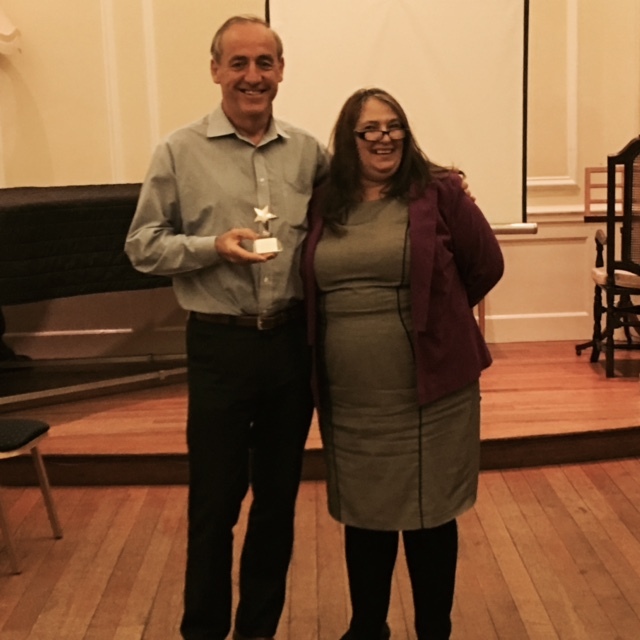 Our Table Topics Master was Paul Lynch who came up with some difficult questions one of which completely flummoxed Anneliese. 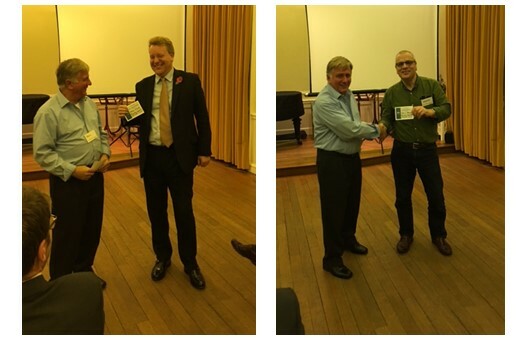 The winners were Richard Murray for best speech, Richard Green for Best Evaluator and Sue Shaw for best Table Topic. 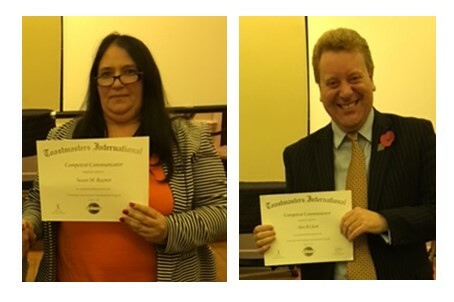 Last week was a great week for Toastmaster meetings! First of all the area contest was held on Wednesday, October 5th. The contest was hosted by Croydon Communicators at East Croydon whose members helped to make it a successful evening. The evening was ably led by Michael Majuru who entertained us all with some humorous jokes during the break. Stephen Davis was the Chief Judge. 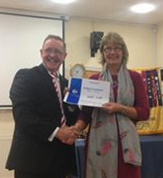 Our club was represented by Neil Pettigrew for Table Topics and Richard Murray for Humorous Speech. Richard gave a very humorous speech about how he came to have a tattoo. However, he revealed in his interview with Michael that he didn’t really have a tattoo. His whole speech, it turned out, had been prompted by something that his children had said to him and was based on conjecture of what might have happened if he had of had a tattoo. That came as a surprise as his speech had been very convincing! Neil’s Table Topic was very interesting – it was to talk about his worst Valentine’s Day – a rather daunting subject but Neil dealt with it very well. He resorted to a good tactic if you’re not sure what to say, which is to get the audience involved and ask them questions and win some time to think. This tactic worked remarkably well because Neil finished second. 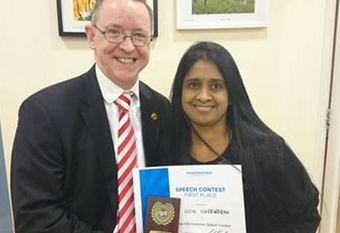 The winner of the Speech Contest was Vidhya Nagendran from Purley speakers with a humorous tale about how she suffered from FOMO and how she was cured from it. The winner of Table Topics was Trudy Kuhn from Speakers of Croydon with rather a sad tale of how she broke up with her boyfriend on Valentine’s Day! The certificates and awards were presented by our Area Director, Mike Abrey-Bugg who then reminded us of the Division Contest to be held this coming Sunday, 16 October at 12.45 pm at Oxted. July has been a really sweltering month – just right for ice-cream and cold drinks down by the beach. 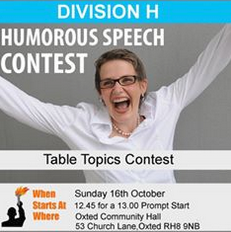 It has been a hot month at Toastmasters also with plenty going on. We started the month off with our Annual Dinner at the Bickley Manor Hotel, which is a delightful location. Drinks and chat were followed by a delicious three-course dinner during which we were entertained by some interesting impromptu speeches led with Gallic charm by our Table Topics Master, Alain Culos. Our After-Dinner speech was given by Daniel Broadhead, a member of Excalibur Advanced Speakers Club and Immediate Past President of Area L9. He is also a Broker, keen chess player and keen swimmer, so we were very fortunate that he was able to take time off from his busy schedule to be with us for the evening. He entertained us with tales of a wedding that he had recently attended, where he had been the speaker. He also told us how Toastmasters had opened up doors for him to speak at other venues and encouraged us to continue in our Toastmaster journey. The dinner was then finished with an official handover from the current President, Ian Brett, to the Incoming President, Paul Andreas who then gave a short speech. A big thank you goes to all those who helped to organise a wonderful evening, including Julie Ward, Dave Henson, Ian Brett and Richard Murray, who was our Facilitator for the evening. On May 5th we held a “Moments of Truth” (MOT) Meeting when members were given an opportunity to tell the Committee of improvements they would like the club to adopt. As a result we have set up a “Welcome Table” near the front door, where we can welcome guests and give them a “Welcome Pack”. It had been suggested that we should wear Name Badges so a vote was taken on it and it was agreed. We welcomed two new members into the club – Margot and Jenny. Alex Clark was the TMOD for the first time and did an excellent job. Susan Rayner gave an inspirational speech, called “Love Your Neighbour”, speech # 10 from the Competent Communicator Manual. John Cross gave an entertaining speech about foxes, #7 from Competent Communicator and Richard Murray gave an informative speech, titled, “The Right Decision” about how to make good decisions. Tony Smith was our Table Topics Master and came up with some very entertaining questions. 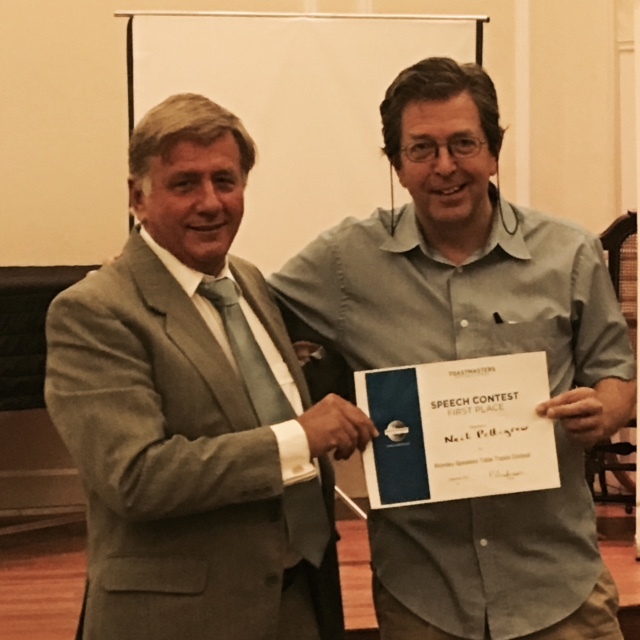 Matthew Allen won Table Topics with an entertaining talk about how to chat up girls at the bus stop. Paul Lynch won Best Evaluator and Richard Murray won Best Speaker.